This week will develop in you a trust that you can communicate with animals, that listening to your intuition is a capacity you can train and refine and that there are ways of testing the veracity of this work. You will also hear many animal stories drawn from the oral tradition and take away some practical storytelling skills so you in your own way can become a voice for our animal companions. The cost of accommodation and meals is not included in the workshop fee. There is either accommodation at Emerson or rooms in the village to suit all pockets. To book and stay or eat at Emerson please use their online booking system. “Noémie and Ashley have put together an inspiring set of activities to open up students’ minds to the rich landscape where story and animals come together. Both are supportive and generous in sharing their extensive background and experience. This workshop exceeded all my expectations.”– Alette, Edinburgh. “Excellent, 5 Stars – 10 out of 10. 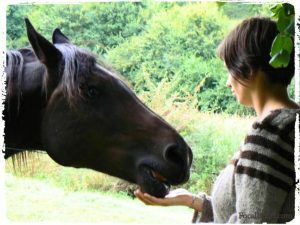 I think the combination Animal Communication and Storytelling worked so beautifully.”– Sarah, UK. Noémie walked out of a successful career as a freelance photographer in France and moved to London to work full-time for the largest Animal Rights organisation in the world. After coordinating campaigns and demos all across Europe, she gave birth to her son and relocated to Sussex. As far as she can remember she always had the ability to communicate with animals telepathically. She deepened her skills with a herd of 40 cows and their farmer, who was very open to animal communication. On the cow’s request, she started to run well attended workshops, starting with the cows first and then later with dogs. She put her Animal Communication work on hold for a few years to take on a 500h+ yoga teacher training with the British Wheel of Yoga. She wanted to explore and deepen her psychic abilities through the practice of yoga, learning techniques that have been used in yogic traditions for millennia.